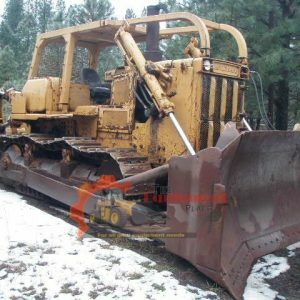 1986 Komatsu D155-1 Dozer. 14.5 yard blade, rippers, 12,560 hours on the meter, recently rebuilt engine. Machine runs an operates as it should! 2002 Komatsu PC 128 US-2 Excavator with 16744 hours on the meter that has been Fleet Owned and Maintained on regular intervals. It comes with a 32″ Dig Bucket and a Hydraulic Thumb. It has the Komatsu S4D102E engine that is rated at 86 HP. the Undercarriage is at 50% and the Pins and Rollers have not been turned yet. The hours are 16,744, the Shoe Width is 20″, and approx 12′ in length. The Width is 8′ 6″ Height is 9′ 4″ and Shipping length is 24′ and the unit weighs 28,660 LBS. 14,293 hrs, U/C @ 75%. The 300HD is a 300 on a 400 undercarriage and frame. Set up with the Forestry guarding. It will need a skin on the bottom of the bucket. Fires right up. Runs and operates well. No known issues.